We are 18 days away from our constitutional deadline to adjourn from the legislative session on May 18th. 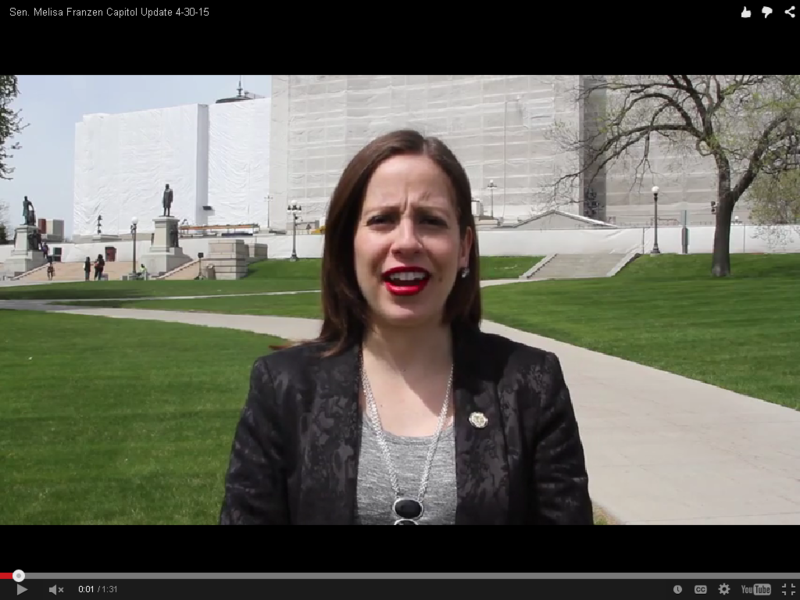 This week we took up two omnibus bills on the Senate floor, the Transportation and E-12 bills. Additionally, one of my bills SF1438 that allows for contracting with retired workers compensation judges was also heard on the Senate floor. Currently, about two thirds of the 23 workers compensation judges are near retirement. My bill addresses a technicality in current law to allow the Office of Administrative Hearings to contract with retired judges who oftentimes have unique expertise in fields such as asbestos to hear cases on a timely basis. It passed by unanimous vote. On Monday, the Senate omnibus transportation bill passed off of the floor, providing new, sustained, and dedicated funding for Minnesota's transportation network. The bill is a comprehensive and honest plan that dedicates new revenue without shifts or gimmicks to maintain our existing network, invest in priority projects, and expand transit options to make our communities more livable for everyone. Additionally, the bill supports much needed safety improvements and upgrades to the state's rail network as increased demand and pressure has sharply increased freight rail volume. Gross Receipts Tax of 6.5% at the wholesale level constitutionally dedicated to the Highway User Tax Distribution Fund – raising approximately $787 million over the biennium dedicated to maintaining and repairing the state's roads. Vehicle Registration Tax increase to 1.5% while increasing the base tax to $20 in 2018 and adding a late fee to $25 a month capped at $100 – raising approximately $195 million over the biennium. Additional fees raising approximately $128 million over the biennium to help ensure stability in funding our transportation network. Metro Transit Sales Tax increase from ? cent to 1 cent sales tax in 7 metro counties – dedicated to expanding bus services by at least 4% annually and ensuring everyone's transportation needs are met, including Metro Mobility, which serves our seniors and disabled persons. This increased funding will allow the state to take on more bonding capacity, allowing an additional $800 million for the Corridors of Commerce program over the next four years. This program has funded projects across the state, and would continue to connect Minnesota's regional centers. An additional $200 million for Transportation and Economic Development (TED) bonding, with an increased capacity for Trunk Highway Bonding. The bill invests $32.5 million annually to make safety upgrades and improvements to the state's existing rail network where crude oil and other hazardous materials are transported and creates an Office of Rail Safety at MnDOT. Outlines numerous provisions requiring MnDOT to increase efficiency in their operations, saving taxpayer's money without sacrificing results. "Driver's License for All" allowing undocumented individuals to obtain a Minnesota driving license. Creates an Active Transportation Program that will target funding for bicycle, trail, and pedestrian infrastructure in the Metro and Greater Minnesota. The bill addresses long-term transportation funding without taking money from other priorities, and will help the state create a 21st century transportation network that supports the growing demands of our aging transportation network. The bill makes investments of $364 million into the E-12 public education system. The bill places a heavy emphasis on early childhood education with the goal of closing the achievement gap and ensuring all of Minnesota's youngest learners are prepared for kindergarten through the $65 million investment into Great Start School Readiness. The Senate passed its E-12 Finance Bill with a vote of 39 to 28. The E-12 Finance Bill invests in a range of important areas; below are some major highlights from the bill. Basic formula increase: $170 million accounts for a 1% increase for both FY16 and 17. This money will mean $57 more per student each year. These dollars form the basis of most school districts' budgets. Great Start School Readiness: $65 million to significantly expand the existing school readiness model. This is a flexible and proven program that allows Minnesota to ramp up its support of publicly funded pre-school programs. Facilities: $31 million for the FY16-17 biennium with significantly more money in the following biennium. With most school buildings ranging in age from 40-50 years old, districts are in desperate need for additional money to maintain and improve aging public buildings. Q Comp: $17 million to help lift the cap on the alternative teacher compensation program. All school districts will now have the opportunity to offer teachers' career advancement options, job-embedded professional development, performance pay, and more. Student Support Services: $8 million helps address the state's inadequate number of counselors and support staff in K-12 schools. Pathways to Postsecondary Program: $4 million will help more high school students take advantage of a program that allows them to take free college-level courses through partnerships between Minnesota high schools and colleges. This program keeps students at the high school – and allows them to save thousands while attaining college credits. Career and Technical Education: $4 million goes into numerous programs to help bring what's happening in industry into the classroom where students can learn skills they can immediately use to transition into the workforce or take the next step in their education. Technology Funding: $6 million to help ensure students have quality access to high-speed internet and up-to-date technology that is essential for 21st century learning. Teacher Licensure: The bill includes several measures that address the teacher shortage crisis affecting the state. These measures will extend the time frame for a temporary teacher license to four years, the extension in place is set to expire on June 30. The bill also includes several measures to simplify the process for out-of-state educators to gain a teaching license in Minnesota. Accountability: As part of preparing the World's Best Workforce, Minnesota high schools are working to ensure students are college and career ready. To that end, the policy bill includes a requirement that schools have a posted policy on how teachers pass students on to the next grade level. Charter schools will also be required to give performance measurements for at-risk students. Congratulations to Edina High School's Kelly Reger for receiving finalist status for the Prudential Spirit of Community Awards.